Custom fields appear beneath Portal Settings in the Portal section of the control panel. Custom fields are a way to add attributes to many types of assets in the portal. For example, if you’re using Liferay Portal to create a site for rating books, you might assign the User object a custom field called Favorite Books. If you’re using the wiki for book reviews, you might add fields for Book Title and Book Author. To add a custom field, click on the Custom Fields link in the control panel. Then choose a resource, click on the Edit link next to it and select Add Custom Field. From here you will need to add the custom field key. The key appears as the label for the field on the form. For some portal assets (like the User), custom fields are a separate section of the form. For others, as can be seen above, custom fields are integrated with the default fields on the form. 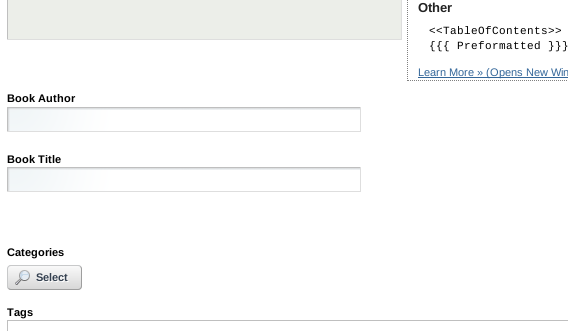 Additionally, developers can access custom fields programatically through the <liferay-ui:custom-attribute /> tag. You can create fields of many different types: text fields (indexed or secret), integers, selection of multiple values and more. Once you’ve created a field, you cannot change its type.